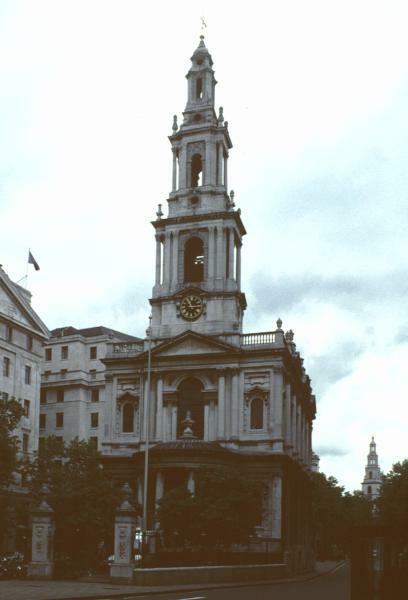 While the Great Fire of 1666 provided the stimulus for church architecture at the end of the 17th century (with Wren as the major designer), so too the Act for Building Fifty New Churches of 1711 was the stimulus for a new wave of church building. 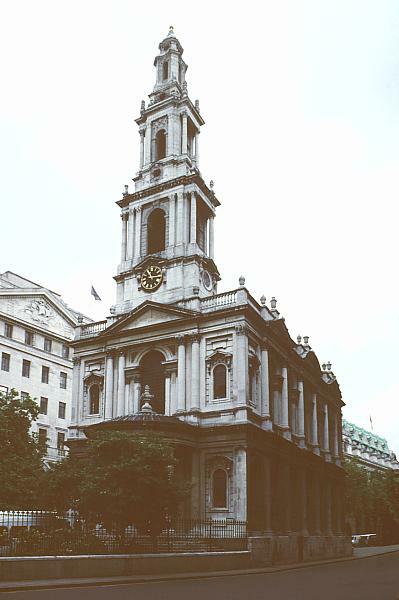 Although Hawksmoor was the most important architect of this period, this church by Gibbs was a consequence of the Act. Unlike most English architects, Gibbs had studied in Rome (with the aged Carlo Fontana) and the western semi-cicular porch owes to Pietro da Cortona's Santa Maria della Pace in Rome more than to English models. Rather than a single "giant" order, the facade is divided into two stories. Thus, the church seems smaller in scale.